Tucked into Arizona about 110 miles east of Flagstaff, you’ll find the largest concentrated area of petrified wood in the world. Scientists estimate that the wood is around 211 to 218 million years old. This park puts its history on display with many beautiful, colorful geological formations made from the petrified trees. With such unique sights to see, it’s an easy decision to put this park on your must-visit list! Below, Ranger Mac will take a look at the history of Petrified Forest National Park and go over some of the many adventures it has to offer its visitors. In December of 1906, Theodore Roosevelt declared the area that’s known as Petrified Forest to be a National Monument. Later in 1962, it was designated a National Park. This park is nestled into an area spanning Navajo and Apache counties in northeastern Arizona and covers around 230 square miles. The main park headquarters sits along I-40 and runs parallel to the BNSF Railway’s Southern Transcon. The park, which sits along historic Route 66, is also adjacent to the Painted Desert, making this a popular route for scenic road trips. Petrified Forest National Park is known for its many fossils that date back to the Triassic period of the Mesozoic era, some 225 million years ago. The most well known fossils of this area are the now-petrified trees that once stood during that Triassic time period. 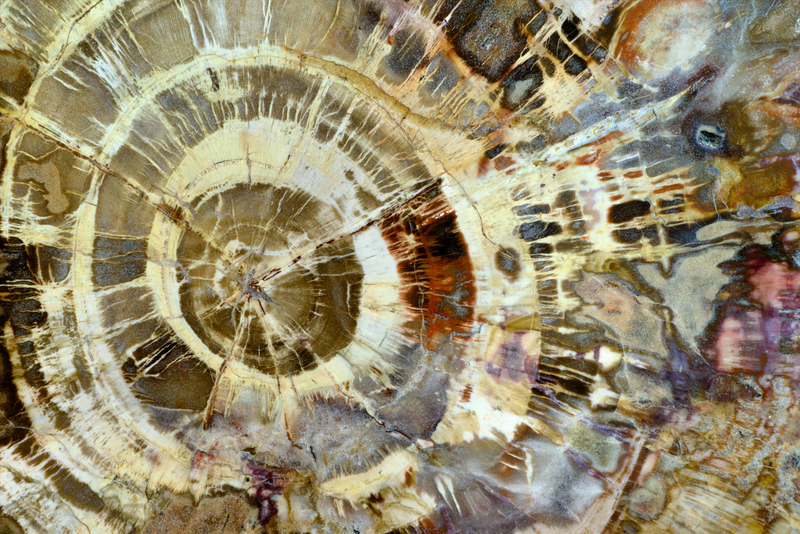 How did these trees turn into fossils? The area used to be flanked by mountains to the south and southeast, with a sea sitting to the west. Streams that flowed across the plains at that time were constantly depositing inorganic sediment and organic matter. This included trees as well as other plants and animals that may have fallen into the water. Most of this organic matter decayed and disappeared forever, but some was buried so quickly that it remained intact. It then fossilized as the inorganic sediment slowly replaced the organic materials, forming the beautiful fossils that we can still see today. Take the Scenic Route - The park entrance off I-40 contains a route running east to west. This route takes you through the entire park and exits at Highway 180, meaning you don’t have to backtrack for your drive. If you have the time, stop at some of the scenic overlooks as you travel through and take in the wondrous views. There’s a visitor’s center at both entrances, so be sure and stop by for more information. Go for a Hike - As you travel through the park, get out to enjoy one of the many stunning hiking trails this park has to offer. There’s a one-way road right off the main route that leads to a one-mile loop of hiking trail that offers a great view of the desert. There’s also the one-mile Painted Desert Rim Trail, along with other shorter trails. If you’re looking for a longer hike, there’s the 2-mile Agape House Trail that’ll take you through a large area of petrified wood. Visit the Museum - Located by the southern entrance to the park is the Rainbow Forest Museum. Stop by during your visit to learn all about the fossils in the park and see some remains of prehistoric animals. This museum also gives you easy access to the Giant Logs, Long Logs, and Agate House Trails. Go Animal Exploring - At both visitor’s centers and the museum, you can find a list of all of the animals and birds that are native to Petrified Forest National Park and the surrounding area. Take the time as you’re out on the trail to look for some of these animals. From prairie dogs to golden eagles, there are many delightful creatures to look out for while in the park. This is a great spot for avid birdwatchers of all ages. You can also turn the trip into a scavenger hunt for the whole family! Visit with a Ranger - The park rangers offer guided tours throughout the park with information on the landscape, the history, and the animals of the area. Based on your interests, there’s sure to be a ranger talk that everyone will enjoy. If you have kids, pick up a Junior Ranger book at one of the visitor’s centers and have them complete the steps to become a Junior Ranger. This includes a promise to keep the National Parks clean and preserved. With this vast open land of sunset-colored sedimentary rocks and beautifully preserved wood strewn across the ground, Petrified Forest National Park is a treasure that’s waiting to be explored. Whether you’re traveling down the old Route 66 or touring all of the National Parks of Arizona, Petrified Forest National Park is well worth the trip. If you want to learn more about our nation’s parks, check out Ranger Mac’s blogs on Michigan parks to the north and Everglades National Park to the southeast!